With Avengers: Infinity War out tomorrow, Disney is once again going to town with its brand partnerships as it seeks to maximise the mileage of the superhero crew. The first two Avengers movies are the fifth and seventh biggest releases of all time at the global box office, while the latest instalment in the wider Marvel Cinematic Universe, Black Panther, has also been a huge hit and stands at number 10 in the all-time chart. "With any of our movies, the key thing is to make ourselves as relevant to as many people as possible,"
Phil Riley, franchise and partnerships director at Disney UK, said. "Partnerships are a great way of doing that." 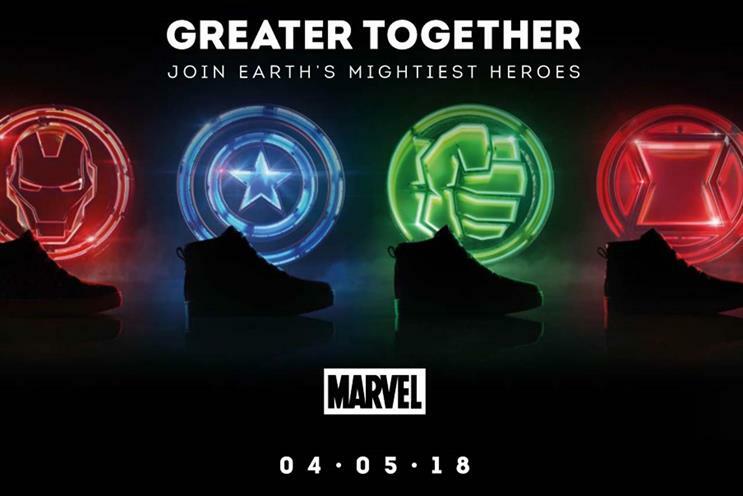 One brand the company is teaming up with for Infinity War is Clarks Kids, which is releasing a set of four limited-edition pairs of shoes, which are based on the characters of Iron Man, Hulk, Captain America and Black Widow. It’s the second partnership this year between Clarks and Disney, following a limited-edition Black Panther Trigenic Evo shoe. That project was "very much aimed at young adults," Riley said, "who may have less affinity with Marvel". As part of a long-standing partnership with eBay, Disney is once again working with the online auction brand and YouTuber Colin Furze. For the release last December of Star Wars: The Last Jedi, they challenged Furze to build a replica of a TIE Silencer, a vehicle from the sci-fi franchise, using only parts he was able to source on eBay. This time, Furze is bringing his engineering skills to the HulkBuster, a suit of armour donned in the film by Robert Downey Jr’s Iron Man. In this project, Furze is working alongside fellow influencer James Bruton, with Furze focusing on the physical build of the HulkBuster – including its hydraulic legs – and Bruton focusing on the computer-aided design and electronic control system. The first two videos from the project – one each on Bruton and Furze’s channels, both 15 minutes long – have racked up more than 1.7 million views in a week. The partnership was about speaking to a distinct, and growing, set of consumers, Riley said: "people who live through YouTube." All of the brand partnerships are about "taking our core brand values and presenting them in new ways," he said. Next year is the 80th anniversary of Marvel, which was founded in New York in 1939 as Timely Publications. "I don’t think there are many 80-year-old brands that feel that current," Riley said.